I love my life! No two days are the same! After a month of pure emotion related illness, I was able to get back to my ‘miracle morning’ of pilates and reflective calm. It felt rather fitting that I could do my miracle morning on today of all days. It felt rather fitting to start my day strong, on purpose, clear. It felt rather fitting to start my day with my favourite routine, with structure, with vision, gratitude and abundance. It felt rather fitting to start my day with energy and light. It felt rather fitting to start my day with the miracle morning as today was Graduation Day! I got involved with the Mosaic mentoring programme earlier this year after a period of reflection and a period of redefining my future. On my vision board at the beginning of the year, I had many pictures – of a boat, swimming in the sea, family, love, health and in the area I opened my mind for my next career moves I had pictures of a book on how to be a coach to children and photos of laptops, coffees and a bubble with the word ‘blog’ written multiple times. I don’t believe it was a coincidence that Mosaic crossed my path. I believe I set my intention at the beginning of last year to work with children, to share the life lessons and professional experience I have and it manifested in a wonderful way. 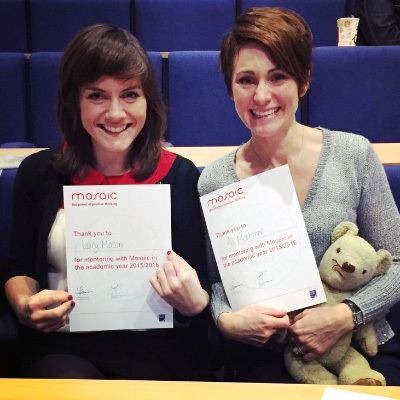 Sitting with my fellow Mosaic Mentor Lucy, we sat proudly as our class related their experiences of the lessons and clapped and whooped loudly as they were presented with their certificates… and we ducked out of the way as they threw their red mortar boards high in to the air. It was a magical moment. A highlight of 2016. I don’t believe it was therefore a coincidence that the keynote and inspirational speaker was one of the most successful bloggers in the UK today – ‘Honest Mum’ Vicki Psarias. She shared her story from being an embarrassed girl with a monobrow (something we have in common! )…to successful filmmaker… to Mum… and then very successful blogger and occassional tv presenter. As I was beginning to question my decisions this year, about redefining myself, my brand and who I want to be… hearing from Vicki made me realize I am on the right path. She reiterated messages from the audiobook I was listening to in the car on the way there: Don’t settle. Keep pushing through the fear. Dream Big. It is possible for you. Take positive criticism, but for all those that want you to fail – prove them wrong. And so, as with always, my life the sandwich… I had wonderful time for me this morning… feeling proud of my mentoring journey, visualizing the next chapter. And this afternoon, I was back to the filling of my sandwich! My lists to keep the house running and Christmas on track… My lists to keep my business running and Christmas on track! The time with the boys… although they are a bit hyper at the moment! The excitement, the sugar… the excitement!!! And I was totally rubbish at learning everyone’s name! Who remembers Wendy? Our role model for the class? This really is such a simple and cunning plan! Congratulations! You were brilliant! The best Mentees! I will miss you all – Thursday morning, what shall I do!